TULSA, Okla. (AP) — A white ex-volunteer deputy who served time in prison for shooting an unarmed black man was recently seen drinking at an Oklahoma bar in apparent violation of the conditions of his probation, which prohibit him from consuming alcohol or being in places that serve it. Robert Bates, the 76-year-old millionaire insurance executive who moonlighted for years as a reserve Tulsa County sheriff’s deputy, was convicted of second-degree manslaughter in the death of Eric Harris in 2015. Harris was fleeing a botched illegal gun sales sting and was being restrained face-down on the pavement by deputies when Bates caught up to him and fired. Bates has said he confused his handgun for a stun gun. 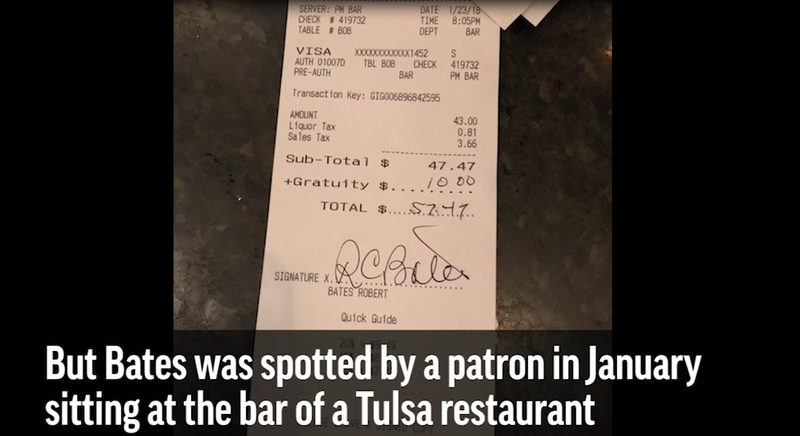 Bates was spotted by another patron in January sitting at the bar of a Tulsa restaurant. The patron, Pat McClanahan, was seated across the bar from Bates, eating dinner with his wife, when the couple spotted him. McClanahan took pictures and a short video clip of Bates. He gave them to a Harris family attorney and also provided copies to The Associated Press. In the images, Bates is seated next to his wife, Charlotte, and wearing a red ball cap and heavy black jacket. A half-filled glass of wine sits in front of Bates, though the video does not show him drinking from it. McClanahan said he stayed long enough at the bar to see Bates consume several drinks of what he said looked like white wine. When Bates was released in October after serving less than half of a four-year sentence, conditions of his release required him to abstain from alcohol and avoid places that may serve it, avoid drugs unless prescribed by a doctor and not associate with people who have criminal records. Elliott says possible punishments include being placed under house arrest, wearing a GPS monitor or submitting to increased urine analysis tests, among others. Tulsa County District Attorney Steve Kunzweiler, whose office prosecuted Bates in 2016, didn’t comment directly on Bates’ situation, but said any decision to revoke parole depends on proof that the rule has been violated and, if true, whether parole officials choose to act on it. “Any person who is administratively placed upon parole is granted that early release with the understanding that he or she will completely abide by the rules he or she signed upon release,” Kunzweiler said. The Harris family hasn’t spoken with authorities about the video or photos. Tulsa County in March settled a federal civil rights lawsuit with Harris’ estate for $6 million. It’s highly unlikely Bates would be sent back to prison for what would be considered “a technical violation,” said Terrence Alladin, an assistant criminal justice professor at Lebanon Valley College in Annville, Pennsylvania, who has researched Oklahoma’s probation laws. Bates’ behavior is less egregious than so-called “affluenza teen” Ethan Couch, who served time in prison for striking and killing four teens while driving drunk and then received probation. Probation was revoked in 2016 after he attended a party where alcohol was served, then fled to Mexico with his mother to avoid punishment. Bates might be more likely to be ordered to perform community service, attend counseling sessions or abide by a curfew, Alladin said. Race and class also could play a role in any decision on how corrections officials treat someone like Bates, according to Lori Brown, a sociology and criminology professor at Meredith College in Raleigh, North Carolina. Eric Harris’ brother, Andre Harris, said Bates must have known that he should not be in a restaurant that serves liquor. “When any convicted felon gets out before the end of his sentence, he knows the deal: If you don’t abide by the rules, then you risk going back to prison,” Andre Harris said. After the fatal shooting, it emerged that Bates had repeatedly bent the rules. A 2009 internal memo written by a sheriff’s office sergeant alleged superiors knew Bates didn’t have enough training hours but pressured others to look the other way because of his friendship with ex-Sheriff Stanley Glanz. Glanz resigned over the scandal and was sentenced in 2016 to a year in jail — which was suspended by a judge— after pleading no contest for failing to release the training memo. In the January incident, McClanahan snapped a picture of Bates’ bill on the counter, which shows a tab of $47.47, liquor tax, $10 tip and Bates’ signature. The receipt didn’t itemize what beverages were consumed. “For me, I don’t think it’s right for somebody to act like they think they’re above the law,” McClanahan said.